At some point, you have to wonder, how much food is too much food? When you can feel your stomach expanding and your pants no longer fit by the end of the meal? Probably too much. Nevertheless, giant food remains a trend, what with a 2-lb. chicken tender now available at the Texas Rangers ball park, or this 6-lb. Golden Giant burger in Tokyo (although, it is suggested that you share this particular feast). You could probably get a few friends to chip in on these latest offerings from Olive Garden as well. From now until May 27, the chain is offering four dishes billed as “New! 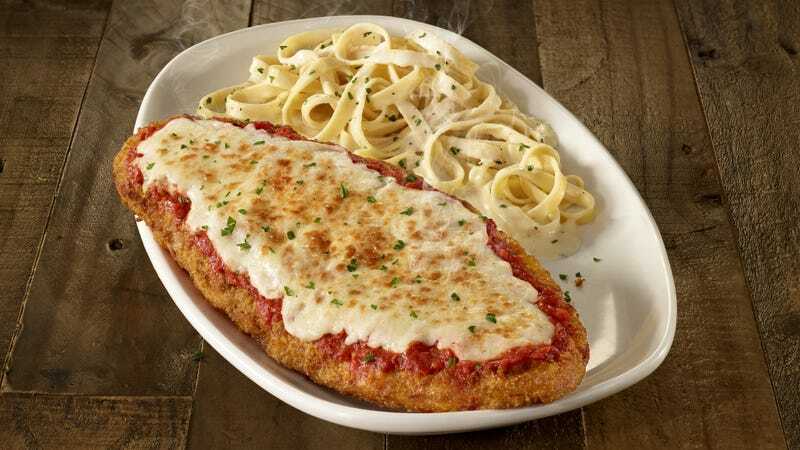 Giant Italian Classics,” serving timeless dishes “now bigger than ever before,” like an almost-footlong chicken parmigiana, a 12 oz. meatball with spaghetti, and giant portions of four-cheese stuffed shells and stuffed shells with shrimp. OG says that prices start at $12.99 apiece. On the other hand, there’s to be said for the sheer bombast of a food you can price out at about a dollar or so an inch. And one of the perks of Olive Garden dinners is you’ll almost always get leftovers. This footlong chicken parm would certainly qualify, and you’ll likely even squeeze a few more meals out of it (Chicken parm sandwich? Possibly an omelet? ).